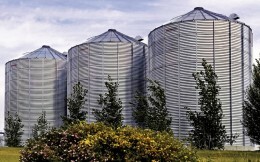 Flat bottom bins are a cost-effective solution for your grain storage needs and Flaman takes great care to provide options from respected brands like Meridian and Twister for you to choose from. 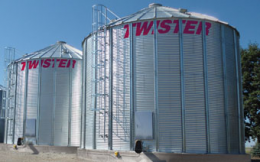 Both brands have stiffened and unstiffened options available of the flat bottom grain bins models we provide, a 30-degree roof slope and are built to withstand years of continuous use and our extreme Canadian weather. Optional additional features that are available for both the Twister flat bottom bins and the Meridian flat bottom bins include full floor aeration, bin sweeps as well as OPI and Bin Sense wireless remote monitoring systems. The Twister flat bottoms we offer at Flaman range in size from 15’ to 48’ diameter, and have a capacity of up to 684,240 bushels, while the Meridian flat bottoms come in 15’ to 42’ diameter options and will hold up to 56, 143 bushels. At Flaman, we will help you through every step of the process. Visit one of our 9 dealerships located across Saskatchewan, Manitoba and Alberta and chat with our Grain Handling Experts, who will be happy to provide more information and answer questions about designing the best grain handling set up for your farm.